Woooooo Hooooo!!! It has been a week and it’s only Tuesday. 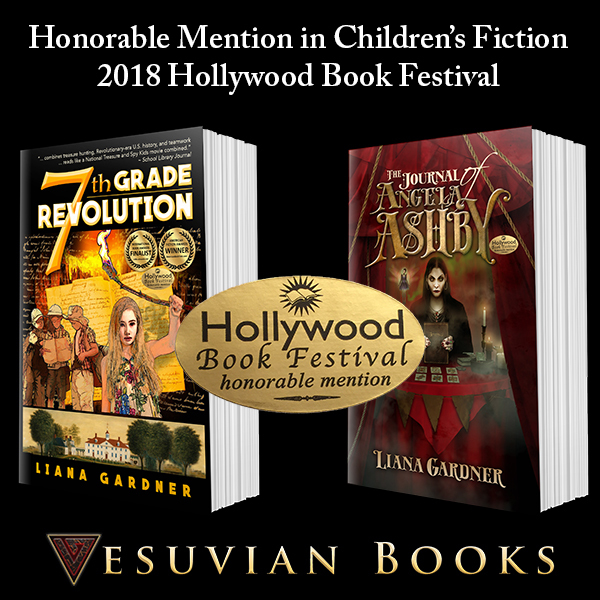 After being delighted to learn about the win in the Pre-teen Category of the 2018 American Fiction Awards for 7th Grade Revolution just three days ago, imagine my surprise when learning than not only had 7th Grade Revolution received an Honorable Mention in the Children’s Books Category in the 2018 Hollywood Book Festival, but so did the upcoming The Journal of Angela Ashby!! I’d also like to give a shout out to my publishing-mates Gareth Worthington for his WIN in the Science Fiction Category with Children of the Fifth Sun: Echelon, Mary Ting for her Science Fiction Runner up honor for ISAN: International Sensory Assasin Network AND Runner Up honors in Unpublished Manuscript for Jaclyn and the Beanstalk (Vesuvian Books 9.4.2018), and Alexandrea Weis and Lucas Astor and for their Honorable Mention for Blackwell in the Wild Card Category and for Honorable Mention for Death by the River (Vesuvian Books 10.2.2018) in the Young Adult Category. So I should probably stop staring at shiny gold seals and get some writing done.